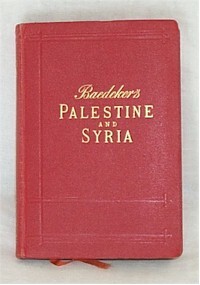 This page shows all Baedeker editions for Greece, Constantinople and Palestine and Syria. Egypt also counts as one of the "Orient Quartet" series, but has its own page. There are many famous collectors' editions in here. Especially notable are the editions on Athens, issued in 1896 to coincide with the first modern Olympic Games - these were reprints from the main edition on Greece and are now extremely rare. There is also a multi-language series on Athens, published by Karl Wilberg in Athens but in full co-operation with Baedeker. The guides consisted of extracts from the Unter-Italien/Southern Italy/Italie M�ridionale series.